Here at [ma-ka-rohn], we've decided to take the game one step further by blending this exotic new flavor in one of our macarons. 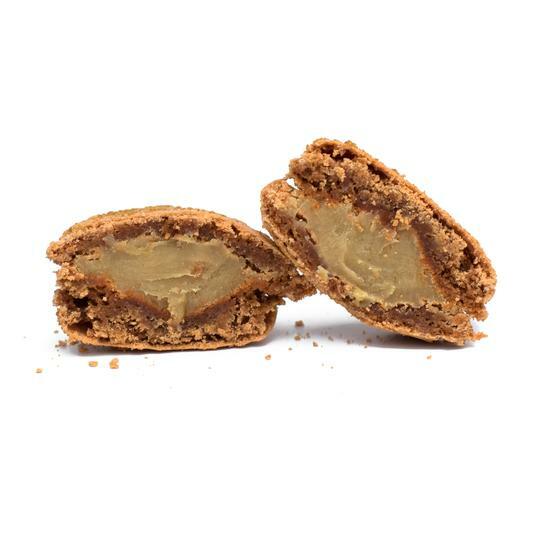 Everything in this macaron is Speculoos flavored; from shell to filling, even the decoration . 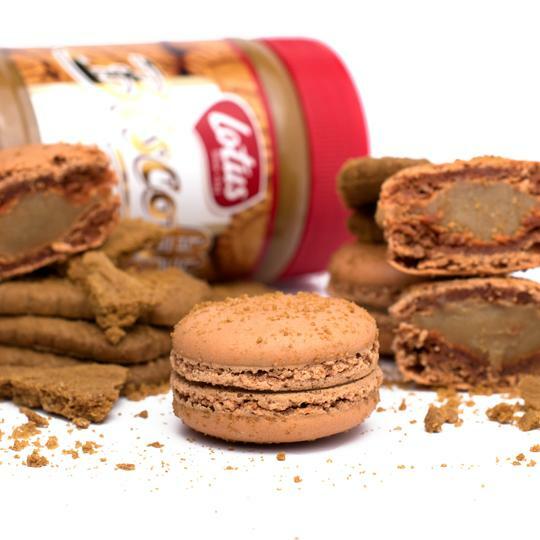 The macarons part is made out of speculos cookie and is topped with grinded speculos. 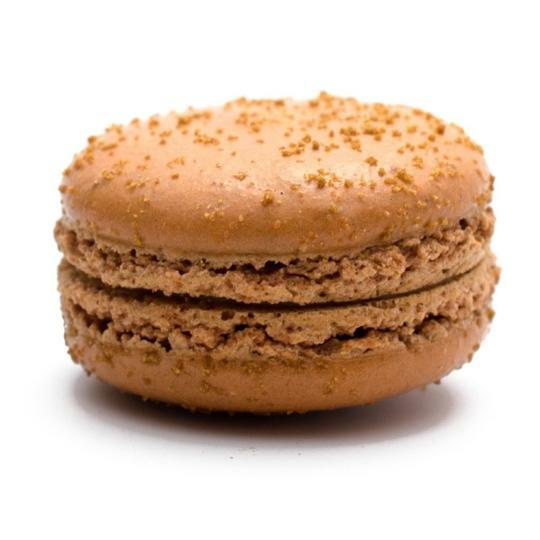 The macaron itself is filled with cookie butter buttercream. There are many ways in which American ingenuity surpasses any other. And yet, in other ways, we’re playing catch up to other countries. For example, why didn’t we invent Cookie Butter? Please allow us to introduce you to this wonder of Belgian ingenuity. Speculoos Cookie Butter is, in its most simplistic terms, spreadable Speculoos cookies. slightly caramelized and cinammon-y, almost-but-not-quite-gingerbread flavor. After the cookies are baked to a fabulous finish, they’re crushed into a fine powder and mixed with magical ingredients and turned into a smooth, spreadable substance we call Cookie Butter. It resembles peanut butter in color and consistency. Make no mistake though, this is a treat through and through. Our macarons are baked daily, packed to ensure freshness and arrival in perfect condition, while adding some fun and indulgence to your day. HOW DO THANKSGIVING RESERVATIONS WORK? 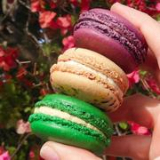 Order your macarons as early as you'd like and leave the rest to us! 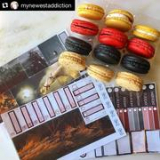 You may choose your macarons by the piece or any variety pack you would like to receive, then just add it to the cart. At checkout, select "Thanksgiving Day reservation" as your shipping method and we will hold the order to prepare and ship the week of Thanksgiving. Thanksgiving reservations are now over. The macarons were packaged very well! I was concerned that such a fragile pastry would get smashed in transit but they all arrived in perfect condition. The flavors were also FANTASTIC - even the ones that I wouldn't think that I would pick out if I was at a bakery in person. That makes me interested to try more flavors because I can't see how I'd dislike any of the ones you make. I did eat all 21 macaron's I ordered in a span of 2 days so it might be sooner than later before I order some more. Thank you! Fast shipping! Great customer service! They expedited their shipping process for me to have these delivered before my girlfriend left out of town! My girlfriend loved them and they were received undamaged and above and beyond my expectations! They also hold up really well we ate the last one a week after purchase and it was still so yummy! I highly recommend the rose flavor it’s so authentic!